We will be welcoming the Jewish New Year at sundown this coming Sunday, September 13, 2015. It will be the year 5776 in the Hebrew calendar. I half asked/half stated to Jonathan, that's since creation, right?! His response, we need to look at the earliest fossil records?! So irreverent, I smiled. 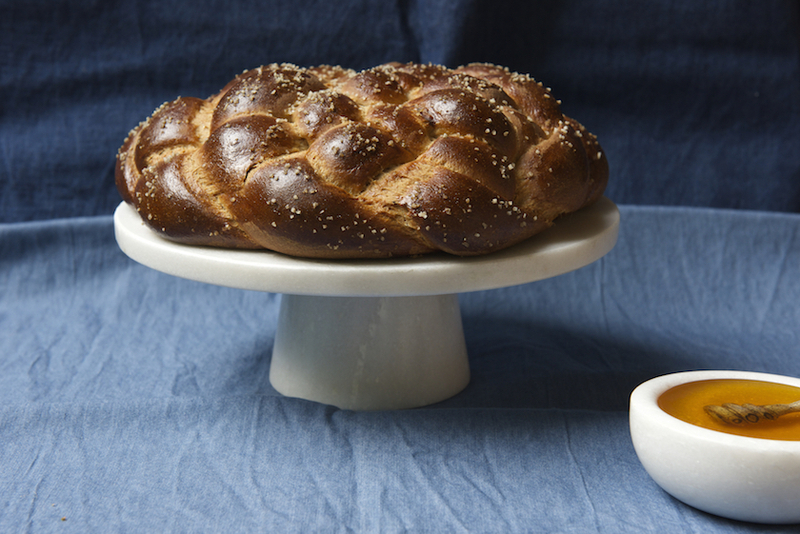 On Rosh HaShanah, as opposed to any regular Friday, we bake round or crown challahs. Why round! Why crown? The circle or cycle of life comes to mind. Togetherness, a hugging circular grip comes to mind. Crown makes you think of a king or a throne. G-d. 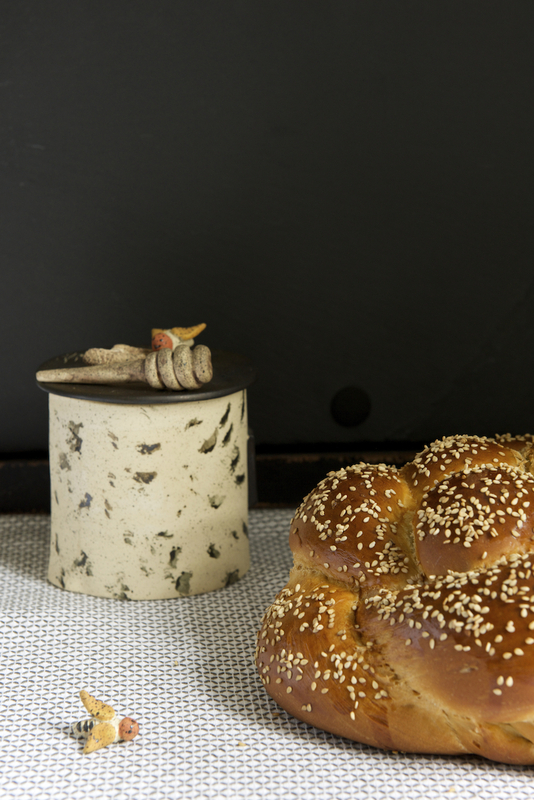 There are many scholarly interpretations and discussions about the round challah shape, the strands and the braiding shape, some are universal. I didn't grow up with my mom baking challahs at home. Most Israelis, including my family, and I can generalize comfortably, buy challahs for Shabbat and the holidays at the multitude of bakeries spread throughout Israel. I on the other hand developed a tradition of my own, baking challah every Friday for as long as I can remember since having my son. I would live to regret it if a Friday went by when I felt lazy and skipped the challah baking ritual. Over the years, especially around Rosh HaShanah, I felt more adventurous, baking stuffed challahs with apples and quinces. In recent years I took it a tad further with more complex stuffed challahs and braiding methods. One thing led to another and I found myself at The Washington Post's Deputy Food Editor, Bonnie Benwick's, home, baking challahs. I developed three original recipes for The WaPoFood section with my true and tested doughs. One round Date, Walnut, Silan and Sesame four strand challah. A second round Fig, Olive Oil, Sea Salt and Spelt four strand (different braiding method) Challah. 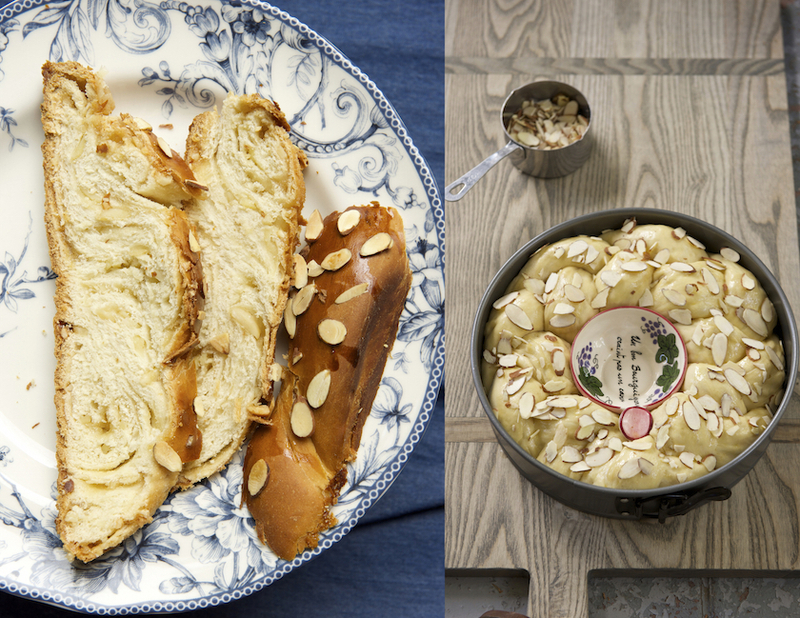 And a third three strand Marzipan, Almond Crown Challah. The beauty of baking with a professional is that she's got it down pat as well. The organizational and timing skills (OMG!). Not to mention the recipe writing and the years and years of experience (double OMG what a job!). I didn't have to send her an equipment list, and BTW her house. or that corner in her kitchen, was super ideal for proofing. I've never encountered such a perfect proofing spot, ever. Maybe it was her touch?! I did however pester her about the oven setting, "It's on regular, not turbo mode, right?!" I asked over a few days four times. I've been "burnt" in the past with a recipe tester who's default turbo oven mode destroyed a few batches until I figured it out. I also naturally worry a lot. By the time I arrived to Bonnie's house, she had two doughs already proofing and the third in the mixer. I sent her the dough recipes in advance. The rolling out, shaping, filling and braiding was rhythmic with pleasant music playing in the background. What happened next, in the pauses in between, as we were waiting for one loaf to proof, another one to bake and one to cool down, cannot be repeated here. All I can say is that I entertained Bonnie talking about that extra curricular education I get on social media, besides food. 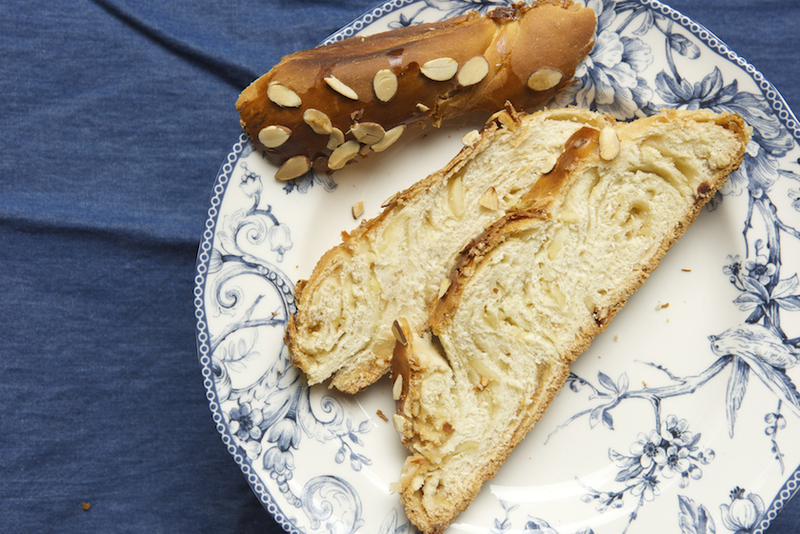 During other pauses, as B sliced into the challahs and we had the first bite of each, we moaned. I self congratulated myself about my challah brilliance as Bonnie laughed. Fortunately, I didn't have to say "off the record" to some of the off topic stuff that came out of my mouth. It's harmless I promise you. 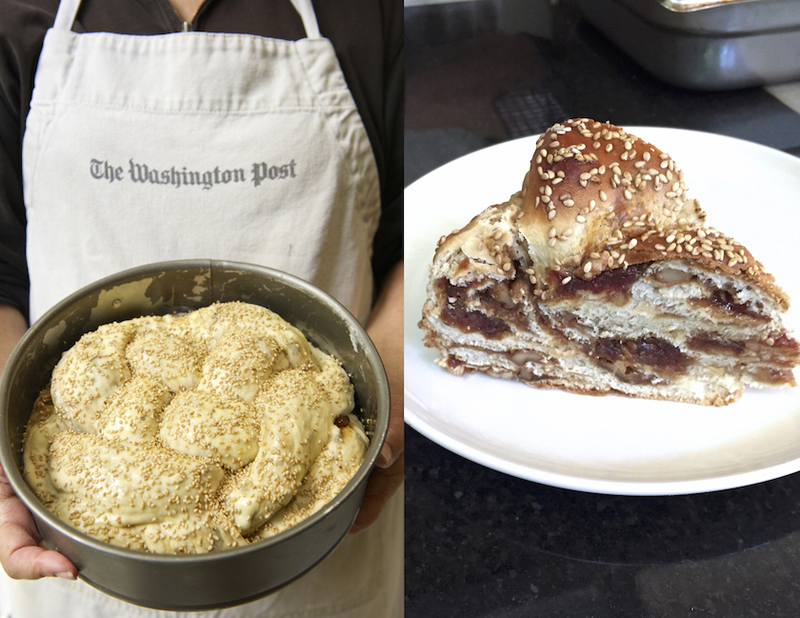 Bonnie wrote a lovely challah story in today's Washington Post Food Section "How to make your challah lovelier and sweeter for the Jewish New Year," with the recipes and tutorial at the bottom. Go pick up a copy. I wish you all could have been there baking together with me, having fun and most importantly tasting these delicious loaves. Even better, click on the links above and bake these stuffed challahs at home. Your family will thank you whether or not you celebrate Rosh HaShanah (the Jewish New Year). 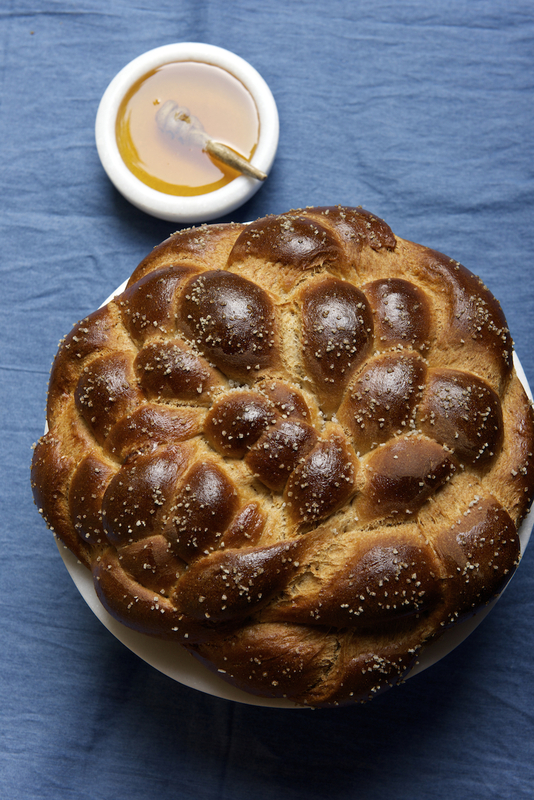 Can this bread recipe for filled challah be made with Gluten Free flour? Anything I should know about using GF flour? Hi Patrizia, Thanks for dropping by. GF baking is completely different type of baking which I am not familiar with. I think you should look into GF resources online or books for challah recipes. I would not recommend it. I've done a little bit of gluten-free baking, and you need all kinds of things (xanthan gum, etc.) to try to replicate the stretchiness gluten gives to dough. For something like this, where you need an elastic dough to wrap around a filling, and not tear when you bread it...well, I don't think it would work. Your best bet would be baking a kind of quick bread, maybe with the filling as a ribbon in the center. Your challah is so beautiful! I want to try the round/crown version.